Springfield, VA – Christine Peterson, president of the Friends of Richard Byrd Library, is a dynamic and highly motivated volunteer in the Springfield community and this year’s prestigious Herb Hunter Citizen of the Year. 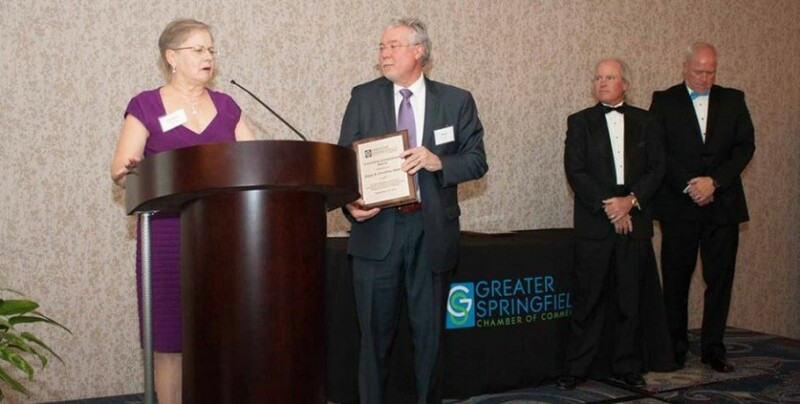 Peterson was one of three award recipients at the Greater Springfield Chamber of Commerce Annual Dinner on Thursday, Dec. 10, which also included the swearing in of 2016 Chamber President Karen Fountain of Flowers ‘n’ Ferns, four other board members to three-year terms, and – for the first time – music from TunedIn, a women’s barbershop quartet, and Gypsy Jazz Combo, a traditional jazz ensemble from West Springfield High School, plus a silent auction. Others recognized by the Greater Springfield Chamber for their community dedication were Dave and Christine Heiby, owners of AutoGrip/Beltway Supply, who were presented with the Innovative Entrepreneur Award, and PFC Stephen K. Carter, one of two Fairfax County police officers assigned to the Springfield Town Center, who is this year’s Public Service Award recipient. When Peterson joined the Friends of Richard Byrd Library in 2005, it had one annual book sale fundraiser. Since becoming president of the Friends, the organization has increased revenue growth by more than 4,000 percent during a five-year period by instituting direct selling on amazon.com, creating a fee for membership program, and through major improvements to its two yearly used book sales. In addition, Peterson has developed partnerships with local government and private sector organizations including NSF, NGA, General Dynamics and Whole Foods Market to increase cash contributions and book donations. The Friends also won grants from Discovery and ExxonMobil to hire summer interns to build the library/Friends brand, especially through social media. For all her hard work and dedication to our community, Peterson was honored with this year’s prestigious Herb Hunter Citizen of the Year award. The Heibys were recognized for demonstrating innovation, community outreach and perseverance through economic challenges. They founded Beltway Supply Inc. in August 2006 to serve federal, state and local governments. The business model worked well until the economic downturn, sequestration and finally the 2013 government shutdown nearly put them out of business. Never ones to let adversity stop them, they retooled and teamed up with friend Gerry Cooper to import and sell AutoGrip, a self-adjusting, locking plyer. In February 2014, AutoGrip became a division of Beltway Supply and the international distributor of AutoGrip tools. Before cofounding Beltway Supply, Christine had worked for 31 years with government and private agencies to assist people with disabilities. Through the Greater Springfield Chamber of Commerce, Christine met Tomoko Taguchi at Brain Injury Services (BIS) in Springfield. Taguchi is always looking for jobs for her clients. It was a match and AutoGrip now employs three BIS clients. Serving the community is in incoming Chamber President Fountain’s blood. Through her family’s business, she has been affiliated with the Chamber for more than 40 years. She credited her late mother and the late Karen Brown for leading her to where she is today. Board members assist the Chamber in fulfilling its mission to bring businesses together in the Greater Springfield area to develop and promote balanced economic growth and business opportunities in harmony with the objectives of the community. In 2015 the board focused on promotion of the new Springfield Town Center and advocated for bringing the FBI headquarters to the underutilized GSA warehouses in Springfield. The FBI relocation will continue to be a priority for the Chamber in 2016. The Greater Springfield Chamber of Commerce is a non-profit, membership-based organization supporting businesses in the Greater Springfield, Virginia area. Founded in 1957, the Chamber formulates and advocates positions critical to business, keeps members apprised of current community issues and provides numerous networking and education opportunities. For more information about the Chamber visit springfieldchamber.org. Copyright © Beltway Supply Inc.